I am extremely fussy about food, and being Italian I am even worse when it comes to Italian food. After several frustrating trips to all the most expensive Italian restaurants in Singapore, I had given up on having proper Italian food in this country. I have been patronising this restaurant regularly since I discovered it. It has been a touching experience being able to taste superb Italian food in Singapore for a very reasonable price. If you have a chat with the Cugini's, you will quickly realise that pride and passion are the motivating factor for what they do. They are not there just to make money by taking shortcuts, but rather to offer the best they can. This, for a foodie such as me, is a very fundamental factor. I have to say that everything that comes out of their kitchen is of very high quality, although my personal preference is the pastas primarily because in from my experience no other restaurant in Singapore is able to deliver the same quality, consistency, innovation and authenticity as Cugini can do when it comes to "primi piatti". 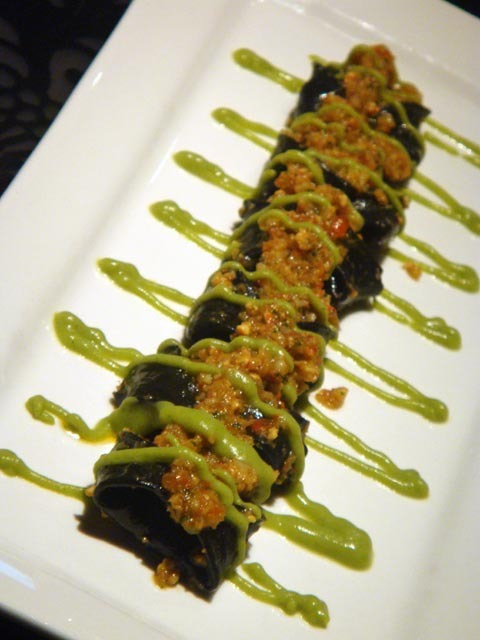 Although I have tried all of their pastas, this particular review will only cover a few sampled dishes. Burrata - This was a special this weekend, and a sweet surprise too. I haven't eaten burrata for about 3 years. For those who don't know, burrata is a fresh cheese that might resemble mozzarella, but texture and flavour are quite different. 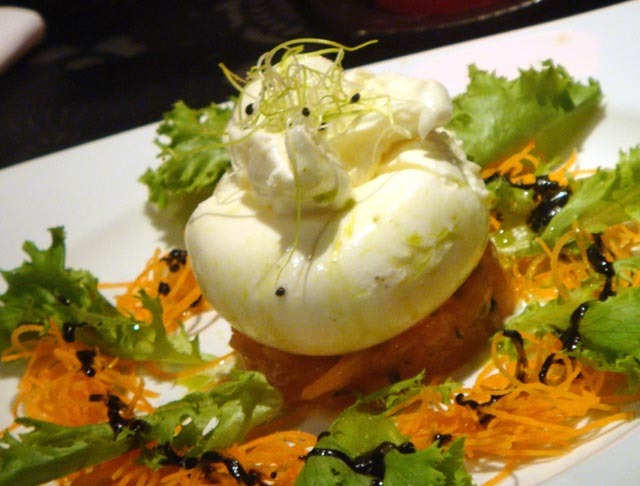 Being able to taste such a juicy, melt-in-your-mouth burrata in Singapore was rather surprising. The simple but tasty condiment of seasoned chopped tomatoes adds that classic Italian flavour to the dish. 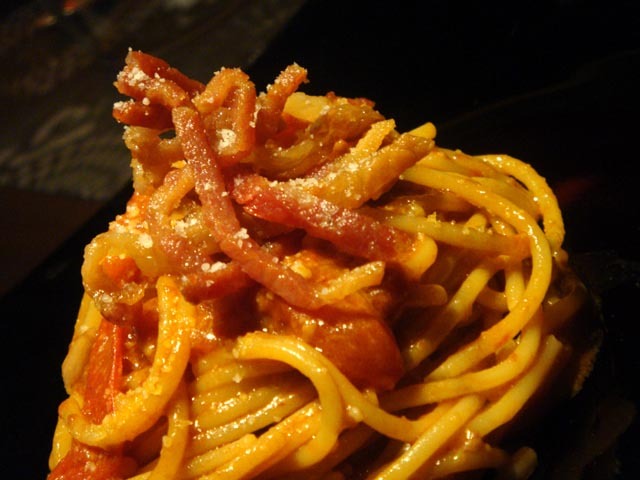 Spaghetti integrali all'amatriciana - This is one of the most classic Italian dishes and one of my favourites, originated from Rome. Not many would believe me if I say that even in Rome it would not be easy to find a plate of such pasta as good as you can have it at Cugini's. I went on a trip to Rome a few years ago, and I was regularly disappointed with the amatriciana's I had in most restaurants. Try this, and you will understand. Ravioli Neri with seabass filling and lobster sauce - this is a special that might not always be available and I had it tonight for the first time. I feel that fish filled ravioli is a particularly challenging dish to prepare, as fish does not have the same richness in taste/texture as meat and cheeses do, when used as a filling. Maintaining the texture and subtle flavour of seabass when preparing it this way is a harder job. However, this dish is a successful concert of subtle flavours and textures that must be tried by all pasta and fish lovers. 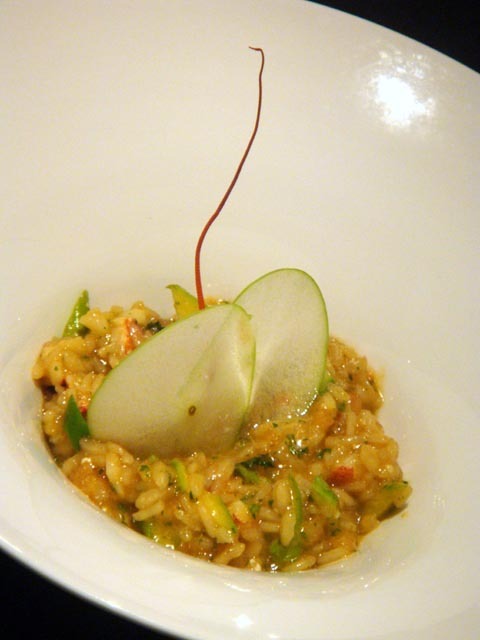 Risotto with lobster, asparagus and Granny Smith - I am not a huge fun of risotto's, but after trying all their pastas, I was interested in experiencing something different. Risotto's can be boring, but this one isn't. The combination of various ingredients and textures - chunks of lobster, crunchy asparagus, buttery overtones - are enhanced by a sharp white wine fragrance (prosecco, according to the Chef), to achieve perfect balance. I have never appreciated seafood risotto's, but there is always a first time. This review is now two year old, when Cugini were located in a different venue and the menu was also quite different (no lasagne, no pizza etc...). Shame to hear that now the quality is not as consistent.